He’s extremely bad at being online. 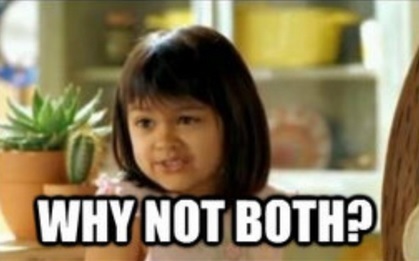 There are two types of people online: the owned and those doing the owning. Try as he might, Senate Majority Leader Mitch McConnell (R-Ky.) wishes he were good at trolling, but he always ends up getting trolled, or worse, trolling himself. Though McConnell is perhaps best known on social media for getting mercilessly roasted by our president, he does a pretty good job of looking sad all by himself. The latest example of McConnell trying to meme his way into America’s hearts and falling on his face came on the heels of Don Blankenship’s loss in the West Virginia Senate primary Tuesday night. Blankenship, best known in West Virginia as the coal executive responsible for the deaths of 29 people and for causing one of the biggest environmental disasters in American history in a totally separate incident, was unsuccessful in his Senate bid. After he tried to sell himself as an outsider who is “Trumpier than Trump,” the GOP establishment generally, and McConnell in particular, directed funds to the primary contest to make sure that Blankenship lost. After the loss, it was time for Mitch to do a little gloating. McConnell tweeted a poorly photoshopped meme referencing the Netflix show Narcos. This was a nod to Blankenship, who spent the primary calling McConnell “Cocaine Mitch” in reference to some of McConnell’s father-in-law’s business dealings. This was just one of a number of insults Blankenship lobbed at McConnell and his family during the course of the campaign. This was not the first time that McConnell tried to use the internet in his favor. Here are some of the Senate Majority Leader’s other attempts at online wit that have fallen flat. It seems like so long ago now, but before Don Blankenship was McConnell’s Trump loving nemesis responsible for killing some people, Steve Bannon was McConnell’s Trump loving nemesis who we could definitely imagine having killed some people. Following the release of Michael Wolff’s book, Fire and Fury: Inside the Trump White House, Bannon and Trump began publicly feuding. McConnell was delighted, as the Senator has long battled Bannon, and holds him partially responsible for the disastrous candidacy of Roy Moore in Alabama. To make the world aware of just how pleased he was, McConnell posted a GIF of himself in a clumsy attempt at a subtweet. Kudos to McConnell for trying to reclaim this gif that is often used to mock him, but this tweet just reminded us everyone that the senator can look unbearably goofy. The first month of the year was a high point for McConnell. He feuded with Bannon and thousands of undocumented immigrants at the same time. Impressive. In an attempt to make it look like Democrats were sacrificing the wellbeing of America’s children by protecting undocumented immigrants, McConnell sent out this tweet. Of course, the problem here is that Republicans opposed both CHIP and the DREAM Act, so this tweet could be easily countered with another meme. Practice makes perfect, and McConnell has a lot of practice posting terrible memes. 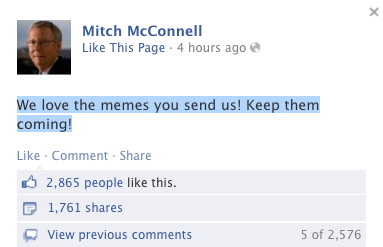 Way back in 2013, McConnell was using recycled memes with a political spin on his Facebook page so often that it earned him an AdWeek article. What kind of dank memes was McConnell’s team posting back when everyone was still using Facebook? Here’s one he posted mocking now-retired Senator Harry Reid (D-NV) for attempting to pass gun control legislation that is maybe inspired by the “I can haz cheeseburger?” meme, which by 2014 was already almost a decade old. Given how many mass shooting have taken place since this meme was posted, to say it has aged poorly is an understatement. In fact, the only time that a McConnell associated moment has gone viral for the right reasons was when the senator was on the wrong side of history. You may forgotten that it was McConnell who said these words. The words became a hashtag. The hashtag became a meme. The meme became a children’s book written by Chelsea Clinton that we hope Warren some some cash from. At least McConnell can say he was a part of one social media success story.